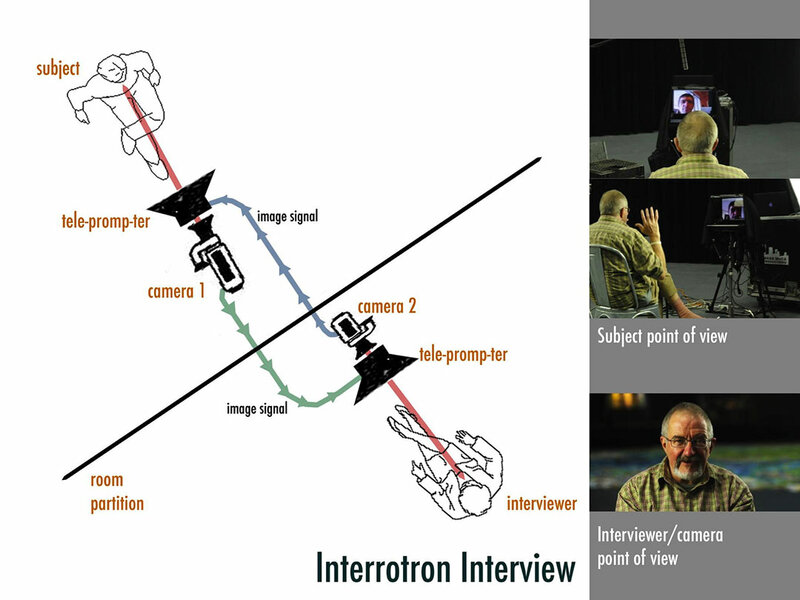 Video-based interview traditionally utilizes a three-point camera/subject/interviewer configuration. It has been observed that camera placement in this configuration can contribute to feelings of alienation, as participants must reconcile the presence of the camera observing them from the side as they attempt to carry on a conversation. This problematic can be circumvented by employing an alternative hardware configuration known as a direct-address interview device. First employed by the film director Errol Morris in 1997 and nicknamed the Interrotron, the direct-address system is created by wiring two teleprompter equipped cameras in circuit. By embedding the recording camera into the line-of-sight between the interviewer and the subject it is possible to provide continuous eye-to-eye contact between the interviewer and interviewee during a filmed interview. Literature and film criticism has explored the aesthetic qualities of recorded interviews collected using this device, yet no empirical studies have explored the effects of the direct-address system on the subject. In this paper, I introduce the direct-address architecture and then frame the question, “What does it feel like to be Interrotroned?” Through participatory design research, I introduce a direct-address interview system to three sets of stakeholders and encourage them to use it. Through the use of researcher prompts I try to create a kind of reflection-on-action cycle whereby participants voice their comments on the design and usability and affect of the system – all the while being recorded by the system. A sampling of video collected via this process is followed by additional insights, observations and social context. Imagine sitting down to be interviewed on-camera. As the red LED lights, signaling the start of recording, even trained actors and the most seasoned and experienced among us are confronted by a most pressing question: “ Where should I direct my eyes?” Usually, one of two options are available: Address the interviewer or, in some odd cases, address the camera. Conversation is a discursive, iterative, complex process requiring the continuous summoning of attention, reflection, thinking and issuing of speech acts. Participating in conversation while attempting to consciously ignore a camera and crew perched to the side –or more difficult still while peering into the darkness of a camera’s lens as an interviewer looks on – can contribute to the alienation of any human subject. The experience of using web-based video chat systems or video conferencing confers similar complications. With popular laptop-computer based “video chat” systems there is a significant angle of incidence between the web-cam and the eyes of the person with whom we are “chatting.” The physiological and aesthetic effect of this design flaw generates an image of the user looking down and sometimes additionally to the side. And on the far end of the conversation users same configuration multiplies the disconnect. As audio/visual communication via web-based video chat (“Skype”, “Google Hangout”, etc.) increases and the need to address this alienation seem paramount. 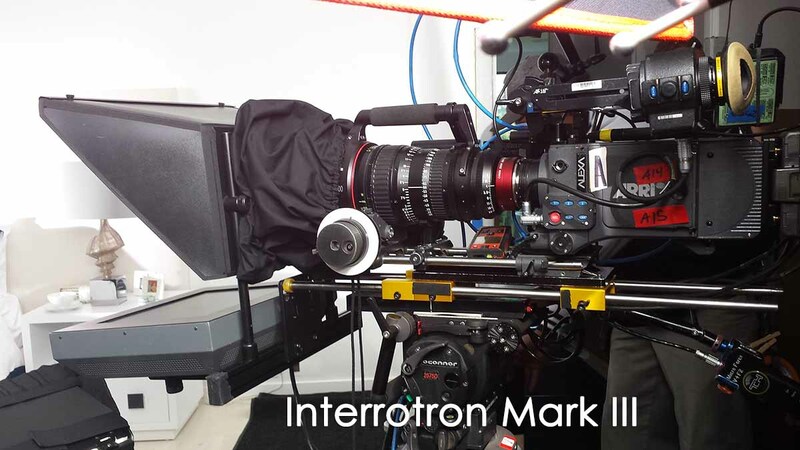 Producer Bill Milling discusses the new Interrotron Mark III, the latest version of the interview machine created by Errol Morris. Now, you can rent an Interrotron with an experienced operator from the American Movie Company. Professional Teleprompter Operator Mia Muschek talks about the new Interrotron Mark III, the latest version of the interview machine created by Errol Morris. Interviewer: But doesn’t the device intimidate people? The direct address system—a device which allows the subject to maintain direct eye contact with the interviewer, and transitively, with an audience at some future moment—has taken well over 15 years to more firmly root as a legitimate technique in the pantheon of so-called “documentary” cinema. It was first used in 1997 by the director Errol Morris, in his film, Fast cheap and out of control. Morris’s wife nicknamed the device the Interrotron (jokingly conjoining the words interview and terror) — though Morris claims that it has never struck fear in any subject’s heart. He has used it on every film and commercial he has directed since 1997. In Morris’s production design, the Interrotron is as important a tool as lights, microphones and the camera itself. The EyeDirect functions like a simplified, more versatile Interrotron. Using only mirrors, the unit allows talent to stare at the director and into the camera simultaneously. We have found that children and untrained talent respond better to this format than typical interview formats. 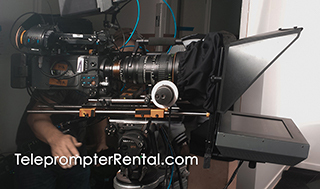 Many directors use our higher end models, such as the Interrotron Mark IV, while shooting in studios, and the EyeDirect rental while they are traveling.